More than fifty years have gone by since Dragnet first took to the airwaves. The early radio broadcasts of Jack Webb’s radio show were so compelling that they naturally adapted to the television screen. Webb’s success with this TV production and its successors is of great note in the annals of television history. So, too, were his philanthropic efforts. To recognize Jack Webb’s devotion to the Los Angeles Police Department and law enforcement, the annual awards presented in his name seek to honor those whose contributions are noteworthy and sustaining. For many, many years, one of the greatest supporters of the Department and law enforcement has been a distinguished woman from the San Fernando Valley. Jane Boeckmann is the President of World of Communications, a publishing firm which specializes in local interest magazines. Away from the office, Jane is very active in the community, offering her support to the boards of the Museum of Natural History, the Economic Alliance of the San Fernando Valley and the Valley Industry and Commerce Association. First Five LA is also privileged to have Jane serving as a Commisioner. It is our privilege to present Jane with this year’s Jack Webb Award. Jack Webb demonstrated his commitment to the Department through his thorough and accurate depiction of the detective work undertaken by Sgt. Joe Friday and his colleagues. Jack Giroud performed thorough and accurate detective work without a soundstage and without a script. He chased bad guys for more than a half-century and taught many, many others how to chase, capture and convict society’s malefactors. Jack’s prowess as a robbery investigator is unrivaled. Each of his ten hash marks was well deserved as is the Jack Webb Award he will receive this year. One of the most notable, and certainly most popular, developments in crime-dramas has been the television show, CSI. Crime Scene Investigators illustrates the use of the forensic sciences to solve crimes. Specfically showcased are scientific developments which were less known to the public than traditional crime solving techniques. The methods and processes are so effectively dramatized that many who previously aspired to a career as the next Joe Friday, now seek work as,”CSIs.” The historical society recognizes this change and is proud to honor part of the future of law enforcement for its role in renewing interest in police work. The original cast and crew of CSI have captured and held the public’s interest for many years. Theirs is a sustaining contribution were are pleased to honor with a Jack Webb Award. The historical society is dedicated to collecting and preserving the storied past of the Los Angeles Police Department. On this occasion it is necessary to recognize and honor not only the past but also the present and the future. With noted author James Ellroy presiding as the master of ceremonies, we are confident we have found honorees who are representative of these times. 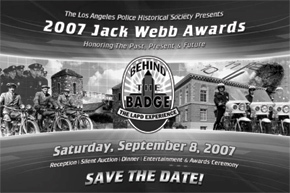 Please join us September 8, 2007 at the Sheraton Universal as we present the 14th annual Jack Webb Awards to these most distinguished and deserving people. It may not have been as unruly as the May Day crowd, but it was definitely a mob that turned out for MOTA day, and we were thrilled about it. The historical society’s first year participating in the Museums of the Arroyo day was a resounding success. More than 1400 visitors enjoyed the museum in the six hours we were open on Sunday May 20th. The event itself featured the historical society and five other local museums opening their doors free of charge. A shuttle service, based at the historical society, transported visitors between the Gamble House, Pasadena Museum of History, Heritage Square, the Southwest Museum and the Lummis Home free of charge. At each of the facilities, special activities or exhibits were established for the day. We were fortunate to have two different, and well-received activities occurring. From the exhibit-side, Keith Bushey and his son Jake, set-up a fascinating look at the badges used in the history of the LAPD. Great examples of rare badges dating back to the Department’s beginnings were on display along with portraits of police officers from the various eras of the badges. The Bushey family efforts were greatly appreciated. Since the museum was experiencing its own equivalent of a U.O. some old equipment designed to serve during unusual occurrences was placed into service. The mobile canteen was set up and used to grill and serve hot dogs and dispense cold lemonade. Of the 1400 visitors, more than 700 paused to enjoy the canteen cuisine. Like the rest of the day’s arrangements, the refreshments were free. This type of undertaking was made possible through much advance planning and lots of dayof – event help. We send our thanks out to the event co-chairs Valerie Nelson and Danny Staggs. On board to help to ensure great success were Commander Terry Hara, Captain John Incontro, Lieutenant Carl Frank and Sergeant Jake Bushey. We also had some great help from our directors and volunteers that stepped up to help. Canteen operations were the sole efforts of Angie Roman and Dallas and Judy Binger. Inside the museum, Nic Lucero, Skip Levi, Gustie Bell, Greg Meyer, Carl Frank, Art Sjoquist, Tracey Schuster, Keith Ricks, and Steve Getzoff and Valerie Nelson attended to the throng of visitors. John Incontro provided expert, and first hand, explanations of the vehicles we had on display. In the days leading up to the event, Bill Rinehart, Tom Hays, Art Sjoquist and Tracey Schuster helped to make sure we put our best foot forward. Pam Huhane, our museum operations manager, provided great staff assistance to all. Given the very posititve feedback we experienced, MOTA day most assuredly will be headed our way again next May. The MOTA day activities capped off a very busy month for the historical society. The day previous, the museum held its monthly open Saturday. These days are busy by their very nature. Simultaneously, a static display was staffed at the annual Memorial Foundation Celebrity Golf Tournament and Family Fun Day at Rancho Park Golf Club. The 1958 Chevy patrol car was displayed for all of the golfers and visitors who attended this annual Memorial Foundation event. Earlier in the month, the historical society participated in the activities relative to Police Memorial Week. With this year commemorating the centennial anniversary of the first recorded loss in the line of duty, our obligations were even greater this year. Kent McCord was the gracious narrator who detailed the first two losses in 1907. The historical society provided portraits of Clyde May and Patrick Lyons for display at the ceremony and assisted with a number of other arrangements. Officer Steve Hillmann coordinated the activities ensuring it was both a fitting tribute and a memorable event for the families of those we have lost. Besides being a part of the great LAPD family, both MOTA day and some of our other pursuits are evidence of our involvement with another community, the museum community. Over the years we have been the recipient of numerous acts of kindness from all corners of the museum community. To try and give something back, we have tried to support the basic levels of this community. Believe it or not, this happens at the grade school level. Located not far from the historical society museum is the Arroyo Seco Museum Science Magnet School. Annually, they host a school function to display their work and the work of local museums. This year we staffed a static display where our 1958 patrol car was on display. We were fortunate to have our historic Chevy displayed along side a beautiful 1957 Chevy convertible being exhibited by the Peterson Automotive Museum. Scores of school aged kids and their families stopped by for photo opportunities and the like. Although the public appearances keep us busy, we manage to find time to improve the museum holdings. In the past couple of months we have received some interesting artifacts. Publications regarding Department war time activities were donated by John Tidmarsh. One of our dedicated volunteers, Gustie Bell donated a vintage detective magazine detailing a case her husband, George Bell investigated. These were very different, and interesting times in the Department. More recently Keith Bushey coordinated the receipt of a number of badges and hat pieces that were being held by the public administrator of the county. These have now found a new home, and will be cared for well into the future. Perhaps our most interesting acquisition, though, is a true piece of history. Used to safeguard the public from explosive devices, the original bomb robot was brought to the museum for display by members of the bomb squad recently. This device was the first known machine designed for the robotic handling of suspected explosive devices in the nation. As the photograph illustrates it is a truly unique looking piece of police equipment that we are proud to have on display. 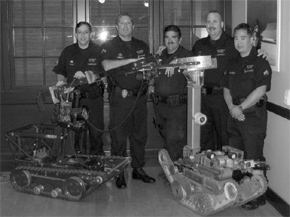 Detective Paul Robi assisted the historical society in obtaining the robot for display. On move in day, he had some talented help from a number of his colleagues moving the two robots into the museum. The other professionals in the picture are (left to right) Sergeant Mike Salinaz, Officer Tony Huerstel, Officer Steve Hennigan, Detective Robi and Officer Rich Nagatoshi. The robots are now on display along with some other interesting material from the bomb disposal business, such as the bomb suit and the bomb sled. It has been a busy few months at the museum, and still more great things are on tap for the balance of the year. We hope to be reporting more great successes in the coming months.